CAPE CANAVERAL, Fla. — After reaching altitude and avoiding inclement weather, a problem with a hydraulic pump ultimately caused a scrub for today’s Pegasus XL launch to carry the Cyclone Global Navigation Satellite System (CYGNSS) satellite constellation into orbit. 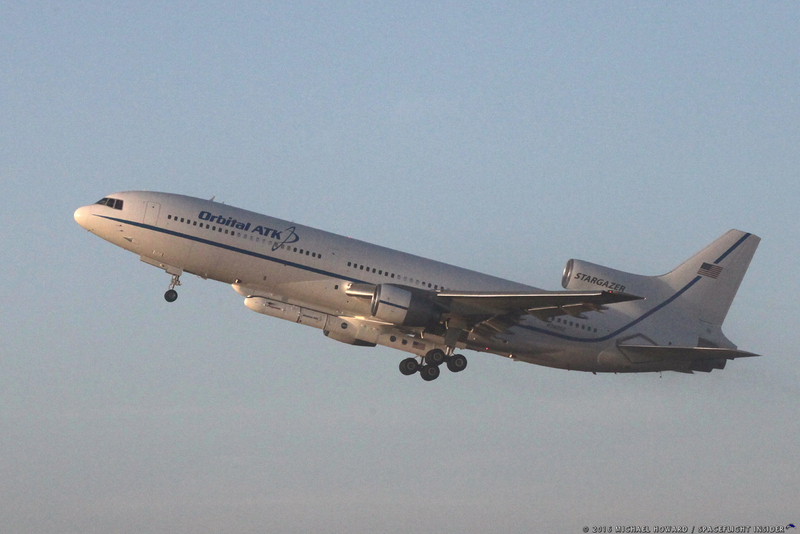 The team on board the modified Lockheed Martin L-1011 aircraft spent nearly the whole launch window troubleshooting the problem; however, more time was needed, so the aircraft with the Pegasus rocket and payload turned back toward Cape Canaveral. Initial indications from the crew are that the problem might be with a circuit breaker on the Pegasus XL’s release mechanism. Orbital ATK has a second window assigned on Tuesday, Dec. 13. While the weather was not the ultimate cause of today’s scrub, the 45th Weather Squadron is predicting better conditions for Tuesday’s launch attempt with only a 20 percent chance of rain. The drop time will be the same as Monday’s attempt: 8:19 a.m. EST (13:19 GMT). The launch window also again be one hour long. If the team cannot solve the problem or if the weather scrubs Tuesday’s attempt, the mission team indicated they would follow the standard process for scheduling another flight and would work around currently scheduled uses of the Eastern Range.